The result of a meeting between writer, director, historian and Python Terry Jones and economics professor and entrepreneur Theo Kocken, the film is co-written by Jones and Kocken. It is co-directed by Terry Jones with son Bill Jones and Ben Timlett, AKA Bill & Ben Productions. A combination of live action, animation and puppetry featuring high profile advocates such as John Cusack, leading experts including Nobel Prize winners Daniel Kahneman, Robert J Shiller and Paul Krugman, the film represents a global movement to change economics through education and encourage debate. Boom Bust Boom proposes a simple idea – let’s adapt economics to human nature. 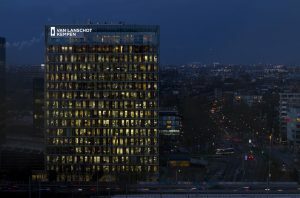 EY has been so kind as to host the screening at their Dutch headquarters in Amsterdam. Please register using the button above. If you have registered, but cannot attend – do let us know as soon as possible, so that as many people as possible can attend the event. Find out more about the film at boombustclick.com, the accompanying educational initiative to drive awareness of the global financial ‘boom and bust cycle’.